Mat Fraser: Loudermilk, Richard III and Drums! Loudermilk, Richard III and Drums! 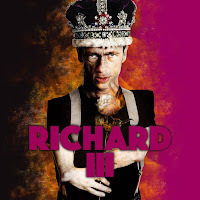 From recovering ex heavy-metaller alcoholic in US TV’s new comedy “Loudermilk” (which is currently showing on AT&T’s Audience Network on Tuesday nights 10.30pm), the right royal rotten Richard III, to the sheer glamour of Panto drummer, all in a year! Exactly a year ago I was in Vancouver filming Peter Farrelly & Bobby Mort’s new comedy, Loudermilk, and now its on TV - at least in the USA. In 2 weeks time as I write this, I shall be back behind the kit, rimshotting the hell out of all the Dame’s and comedian’s jokes, in the Lower East Side of New York City. The last 3 weeks of 2016, and all of 2017, has been an amazing year so far for me. 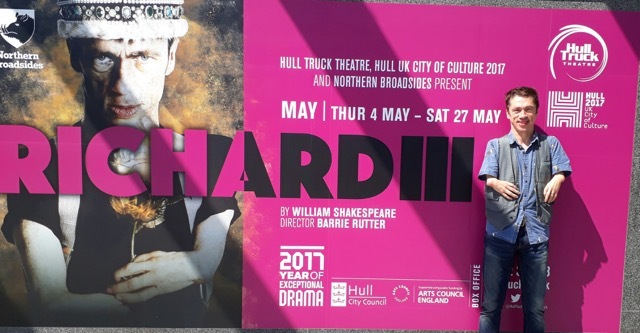 In April I auditioned for and got the title role in Theatre Co. Northern Broadsides’s 25th anniversary production, in Richard III. At Hull Truck Theatre during Hull’s magnificent City of Culture year, and the last Broadsides show to be directed by the legendary Hullensian Barry Rutter (who started the Company), I was honoured to be amongst several seasoned Shakespeare actors making this stripped down brutal version of the famous play. We made a fantastic exciting radical production of the deformed King’s rise and demise. Best of all was having Mr Roy North from Basil Brush in the cast. Amazingly I was the first actually disabled / deformed actor to play him the UK! We rocked it, and it was by far the most challenging, and thus also rewarding acting job I have ever done. Reviews were good, we even got a mini feature on C4 News! I absolutely loved my 9 weeks in Hull. A lovely Town full of great people and fantastic art. As part of doing this, I was commissioned to write an opinion piece for The Stage about perfoming disabled roles and blacking up / blackfacing etc. in front of the poster, happy about the reviews! Mat Fraser plays Richard III with a raw directness and enormous wit. Shakespeare’s “crookback” king is reborn — and he’s funny, clever and scary as hell. Fraser’s portrayal is one of confrontational force, exuberant nastiness and enormous wit… rough and slippery, cunning and coarse. He snarls, he sniggers, his eyes burn; he spits self-loathing and uses his body to unnerve his opponents… By the time he reaches Bosworth Field, his gaze has a chilling vacancy that suggests psychosis. Fraser gives it a throbbing, pitch-black heart. His manipulation of the verse is remarkably dexterous / in this self-introduction – light, genial, inoffensive, then snapping with anger. Fraser smiles, he seethes, and piercing beneath the surface of the poetry, embodies what it means to grow up differently abled, to be constantly judged, treated as “other”, even spat at. And very good Fraser is too, pulling the audience into his murderous plans. Fraser has a certain wicked charm that - dare I say it - almost makes you want him to get away with it. / He shows that villainy can be attractive. Fraser plays on his outsider status brilliantly, creating a sense of a man bitterly aware that he will never fit in. Fraser is a uniquely compelling performer with a guttural rasp of a voice and a face that projects innocent charm one moment then contorts with disgust / at the ease with which he is able to manipulate the world around him. ... Then I went back to NYC, and started started writing "Jack & The Beanstalk”, which has been our major work for the year since then, and we’re coming to showtime really soon! Having finished the 3rd and final draft, making all the cuts Julie Atlas Muz the director wants, I’m currently building and refining my drumkit settings using my new Roland V Drum TD 30, a monstrously good kit. I LOVE drumming, its a zen calming thing, whilst also being a beating things up thing, and being the controlling rhythm of the soul of an artistic thing is wonderful. Here’s a silly clip of me drumming. I’m working on a much better one soon!